I’m in a crossroads in my life where basically I just have to be OK in the unknown for a moment and wait and see what life presents itself. In yoga theres a pose that is often taught towards the end of class which in essence one would assume to be an ‘easy’ pose compared to arm balances and such. Its when you stretch your legs out in front of you and fold forward over your legs. You literally fold into yourself. This can be the hardest pose for people to do as there is no external stimulus-you’re facing yourself. This makes a lot of people uncomfortable and they begin to shift, to make adjustments in the posture. Its extremely hard to be quiet and not fidget. Thats where I am right now. Accepting the need to be still. 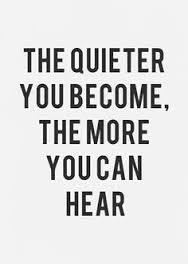 I also need to listen more to myself which takes a moment. In the wild pace that we live listening can go by the wayside. Snap decisions and the compulsion to keep going and not stand still is the norm. So its raining cats and dogs today and I am spending more than my usual New York minute listening to myself.